The new MERE PRO 4.0 control has been rebuilt with a new ProgID and ClassID and can now be used with VB6. The MERE PRO 4.0 control has a smaller memory footprint and has new methods still being added for new Shape Objects (AddArc, AddPie, AddChord and more). Improvements have also been made to reduce the memory usage for rendered reports. MERE 4.0 and MERE 3.x can reside on the same machine without conflict as they have different ProgIDs and ClassIDs. The VB6 Demo application shows some of the programmatic control that you have when using the Mind's Eye Report Engine PRO Version 4 ActiveX Component. The New LITE Version is intended for web application use and applications that don't require a Print Preview. This new control has far fewer PEMs than the Professional Version and is less expensive. It still provides you with a Royalty Free Runtime License for deployment of your applications. Enhancements have been made to the SMTP Email Support. A new property for EMAILBodyHTML can now be used to easily send HTML emails with attachments that properly display HTML. The EMAILBody property is used to set the body text for the plain text portion of the email. HTML emails now properly display the attached file as a separate attachment rather than being embedded in the HTML text. Corrected an issue with the SendMail() method not using the EMAILSMTPPort specified for non-standard ports. 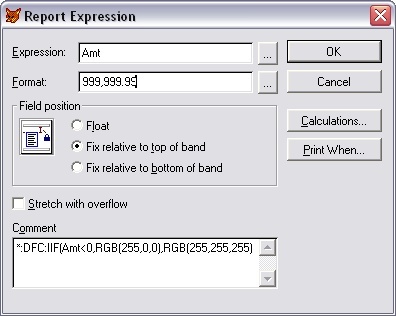 Corrected an issue with an OLE Error when using PRINTER FONTS with the new GDI+ MeasureString() function which does not support PRINTER FONTS and returns a length of zero. Save as Image now available from MERE ActiveX toolbar. Now, end users can now save report pages as Image files while previewing reports. Multi-page TIFF File Support added to both the Save as Image Dialog options and from the SaveToTIFF() Method. 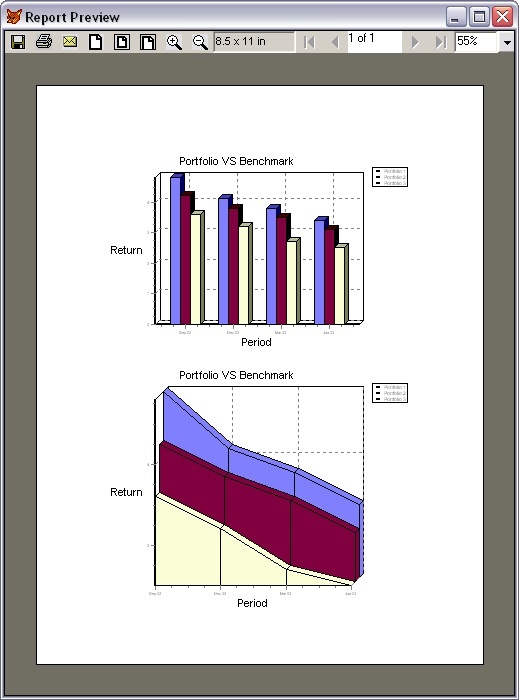 Page Preview of report pages was added to the Save To PDF, Print and Save as Image dialogs. The MERE_ReportListener class is now available for use with the Mind's Eye Report Engine ActiveX control that supports running Visual FoxPro FRX Reports using Visual FoxPro 9's object-assisted report engine. Please use the latest version of the MERE ActiveX control which has additional parameters in the AddText() Method to support the new MERE ReportListener Class. The Text Search capabilities have been improved to support Find Next and Find Previous. The new text search is now located on a toolbar for easy access. The new PDFStream Method returns a PDF Document as a String. Therefore, PDFStream can be used to send a PDF document back to a web server without generating any files on disk. This can also be used to store a PDF Document into a Memo Field in a table. Eliminates the need for placing Multiple Report Objects on reports and then having to use PRINT WHEN Expressions to hide or display those objects depending on which Report Object you want displayed. Simple to use. Simply place a Dynamic Property Expression Directive in the COMMENT of a Report Object in the VFP RW to be Evaluated at Render Time when using the Mind's Eye Report Engine. EMAILAddAttachment Method to support adding additional attachments to files sent using the SendMail Method. EMAILAttachmentCount Property to track the additional Files added to the EMAIl Attachment list using the EMAILAddAttachmentFile Method. Copy a Report Page in the Report Preview directly to the Clipboard from the Popup Menu. This feature allows you to quickly Copy any Report Page directly into other Office Applications such as Microsoft Word, Microsoft Excel or Microsoft Publisher with a couple of mouse clicks. Paste Objects from the Clipboard onto a Report Page. This means that Word formatted text can now be added directly to a VFP Report both Interactively by drawing a Bounding Box or by calling the new AddFromClipboard() Method. Holding down the SHIFT key while drawing a bounding box will maintain Aspect Ratio on the object. Holding down the CTRL key while drawing a bounding box will size the object to fit in the bounding box. The screen shot above has Microsoft Word text at the top then 2 Microsoft Visio diagrams in the middle, a Microsoft Publisher page on the bottom left and a Microsoft Excel Chart all drawn onto a single page from the clipboard. A simple COPY was done after selecting objects in each of the applications and then a bounding box was drawn to drop in the objects. Metafile objects placed onto the report page are fully scaleable and can be zoomed to > 100,000%. Sample program REPORTTOWORD.PRG included in the BETA Download to demonstrate using the Clipboard to Export all of the pages in your report to a Microsoft Word document. 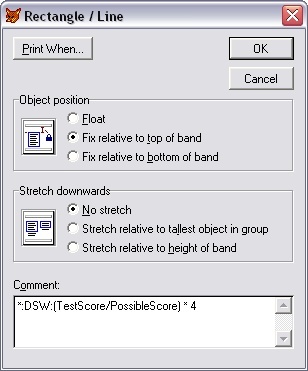 The ability to save a Report Page as an Enhanced Metafile, JPEG, PNG or BITMAP Image. You can even specify the maximum dimension of the Image Size in Pixels allowing for the quick and easy creation of a Thumbnail representation of a Report Page when creating JPEG, PNG and BITMAP Images. New buttons have been added to the Toolbar which can be hidden which allows an end user to add new pages and delete pages while in the Report Preview. This will allow your end users to annotate reports as well as merge in other documents as shown in the screen shot above. Printing reports now supports Shrink To Fit. Now printed output can automatically be resized to fit to the Printable Area of the page. This includes support for pages that are defined larger than the currently selected page size. Therefore an 11x17 can be printed onto an 8.5x11 piece of paper. Assign Paper Bins to each page in a report. This provides the ability to print the first page of a report to letterhead and all pages following to the default tray. The new PaperBin Property is assignable for each and every page in the report. PDF Output now supports Barcodes Without Requiring Any Barcode Fonts! The Mind's Eye Report Engine ActiveX Control makes it easy create reports programmatically using Visual FoxPro, Delphi or VB using the Mind's Eye Report Engine ActiveX control. Additional support for running Visual FoxPro FRX Reports without modification is handled via a Visual FoxPro Class Library included with the Mind's Eye Report Engine Control. 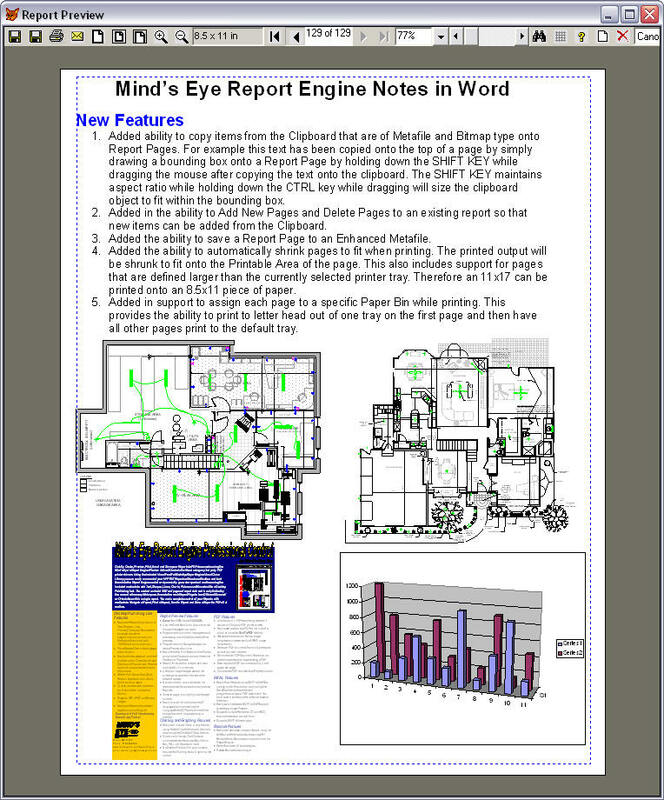 The Mind's Eye Report Engine makes it easy to create Charts and Barcodes in a Report. It can supports saving reports to PDF without requiring any 3rd party PDF printer drivers or tools. The Report Preview can ZOOM greater than 100,000%, and it handles PAGE X OF Y without making any extra passes on the Report. It supports Multiple Page Sizes and/or Page Orientations in a Single Report Preview which can be printed as a single print job or saved as a single PDF document. Since the Visual FoxPro FRX Reports can be ran without modification and loaded into the Report Engine using the included Visual FoxPro Class Library, you can even extend it's capabilities to add support such as Subreports and more. It's like having a desktop publishing page layout tool that you can manipulate programmatically. The Power of this tool is that you now have a Report Object that you can manipulate at runtime and it is extremely fast. More Desktop Publishing like support for your reports. The next release will support adding image objects such as charts, drawings and formatted text from the Clipboard from other applications such as Office, Visio or Publisher. This can be done interactively in the Report Preview by drawing a bounding box or programmatically using the new AddFromClipboard Method. This opens the possibility for merging several different object types and items into a single Report Preview for printing or saving to PDF. Paper Bin assignments for each and every page. Each page can now be pulled from a different Paper Bin by setting the PaperBin Property on each page. Shrink To Fit printing so that all of the information on a defined page will fit onto the currently selected printer regardless of the printer's printable page area. Improvements to the processing and handling of Visual FoxPro FRX Reporting. Barcodes implemented in the PDF Documents without using any Barcode Fonts. The barcodes are drawn directly into the document as shape elements. Charting improvements have been made so that Multiple Data Series can now be added to a single chart. Email Reports with the click of a button as a PDF attachment using SMTP built into the control or via MAPI if installed or you can also call the SendMail Method in code. Easily place a Watermark on your Report Pages by simply setting the WatermarkText and Watermark RotationAngle Property. No more hacking the FRX to stretch a graphic trick required.